Manure on Your Farm: Asset or Liability? If farm animals spend any part of the year in barns, stalls, pens, loafing areas, or feeding areas, you will need to deal with manure from those areas. What do you think about that manure? Do you view it as an asset? Or, do you see that pile as being a liability? This fact sheet compares the value of different types of manure as sources of nutrients and organic matter. It describes how to make manure on your farm an asset rather than a liability. ore than 65% of the phosphorus that a steer eats will be passed into the manure. Most of the nutrients that animals eat end up in their manure. The amount of nutrients in manure depends on the type of manure and how it is handled. 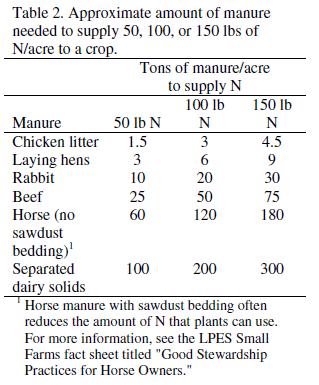 Poultry manure contains the greatest amount of nutrients, while horse manure has much less nutrients (Table 1). Manure that contains lots of bedding will have fewer nutrients per pound than pure manure. Poultry manure contains the greatest amount of nutrients. The nutrients in manure are a mixture of inorganic and organic forms. Many of the inorganic nutrients in manure are the same as those in a commercial fertilizer. These nutrients include ammonium nitrogen, soluble phosphate, and potassium salts. They dissolve in water, and plants can use them right away. release nutrients because plants cannot use them immediately. These slow- release nutrients become available to plants as the manure decays in the soil and releases the nutrients. Liquid manure and solid poultry manure contain large amounts of inorganic nutrients, especially nitrogen, that dissolve easily. Most of the nitrogen in other solid manures is organic and is slowly released. 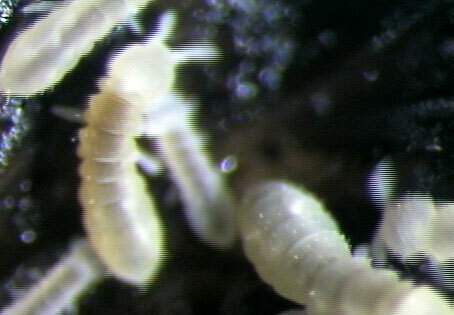 Tiny insects in the soil (Figure 1) break down the organic matter in the manure. This releases nitrogen and other nutrients into inorganic forms that quickly dissolve. 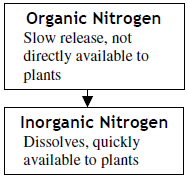 The type of manure and the environment determines how quickly the nitrogen is released (Figure 2). 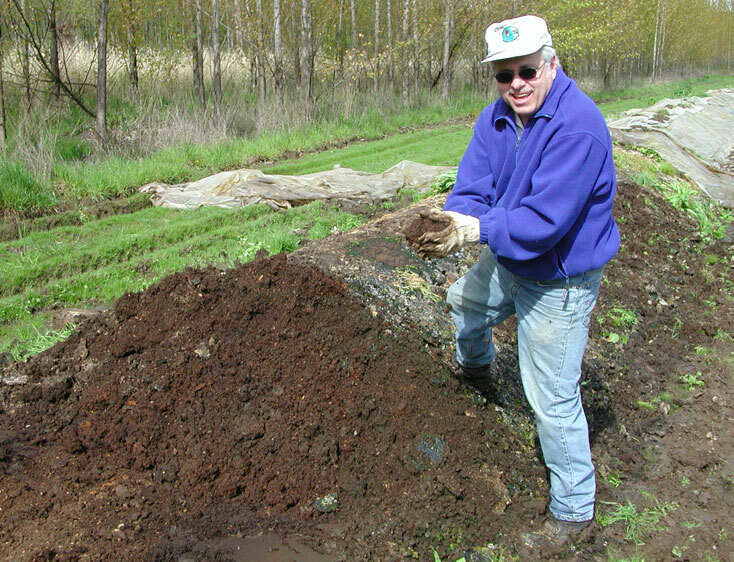 Fresh manure breaks down faster than composted manure. Poultry manure breaks down faster than manure from horses, cattle, goats, and other animals. In general, the more nitrogen that manure contains the quick- er the nitrogen is released. Figure 2. Organic N from manure is slowly released as inorganic N in soil. Fresh manure breaks down faster than composted manure. when the soil is cold or dry. Thus, nitrogen is released quickly from manure during the spring or summer and slowly during the winter. Not all manure provides nutrients to plants. As it breaks down, manure containing lots of bedding takes nitrogen from the soil. This reduces the amount of nitrogen available to plants. also will slowly release smaller amounts of nutrients. Most other types of manure contain fewer nutrients. Their nutrient value per ton of manure will be much less. If we only think about nutrients, we do not recognize the full value of the manure. The organic matter in manure is also valuable because it makes soil easier to manage, less likely to erode, and more likely to absorb water. These are important benefits that inorganic fertilizer does not provide, but it is harder to put a dollar value on them. The organic matter in manure is valuable for making soil more productive and easier to manage. How Much Manure Should I Apply? crop yields and can lead to nitrogen filtering into ground- water like wells and aquifers. In dry regions, salt may accumulate in the soil. Applying too much manure may reduce crop yields and can lead to nitrogen filtering into wells and aquifers. To estimate manure application rates, follow these steps. Decide how much nitrogen your crop You can get this information from fertilizer guides or production guides for the crop you are grow- ing. These are often available through your local Extension office. Then use Table 2 to estimate how much manure to apply based on the amount of nitrogen you need. It is not practical to apply more than 60 tons of manure per acre to any field larger than a garden. If you are applying manure to pastures or hayfields, the rates should be much lower to avoid smothering the crop and slowing its growth. If you use low-nutrient manures such as horse manure, you will not be able to apply enough manure to meet crop nutrient needs, and you will need to supplement with other nutrients. Horse manure is best used as a source of organic matter rather than nutrients. The numbers in Table 2 are averages. Manure nutrient values can vary widely from farm to farm. 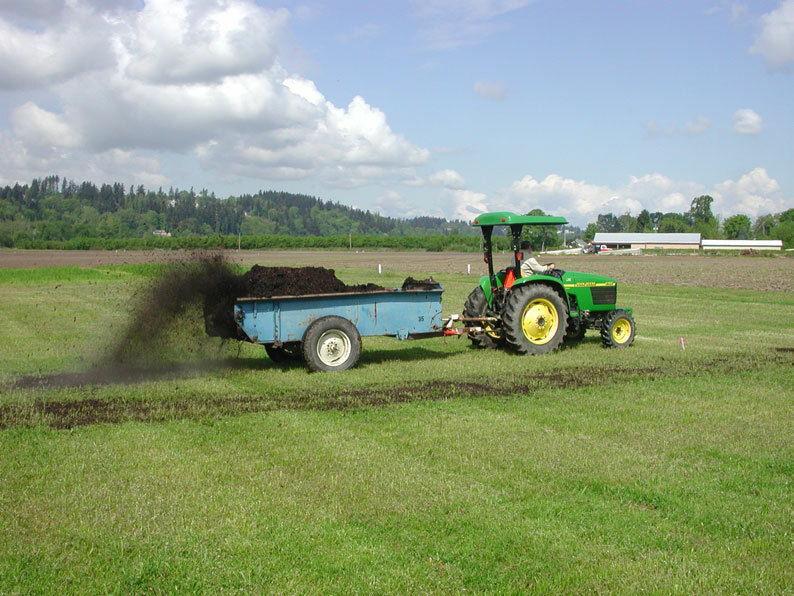 If you want more information about testing and estimating the nutrient value of manure from your farm, read “Fertilizing with Manure,” available from Washington State University Extension. How Do I Apply Manure? For any field larger than a garden, a manure spreader is a great timesaver. Manure spreaders vary in size, depend- ing on the amount of land you need to spread and the size of your tractor. again, and measure how much land you covered (Figure 3). You can also estimate volume spread by calculating the volume of your spreader. For details and simple worksheets on calibration, see “Fertilizing with Manure,” available from Washington State University Extension. Figure 3. Calibrate your manure spreader so that you have a good idea of how much manure you are applying. When Can I Apply Manure? like wells and surface water like streams and ponds. This issue is especially a problem for nutrient-rich manures such as poultry litter. To get the most value from manure, apply it close to planting time. If you have manure that has few available nutrients, you can apply it in the fall before planting, as long as the manure is not likely to wash into nearby streams and ponds. To keep the manure in place and reduce runoff during the winter, plant cover crops like rye and oats whenever you apply manure in the fall (Figure 4). A fall-planted cover crop such as rye pro- tects the soil and prevents manure runoff during the winter. Figure 4. A rye cover crop protects a field fertilized with manure. Is Manure Safe to Use on All Crops? Fresh manure sometimes contains pathogens (such as bacteria and viruses) that can cause diseases in humans. Salmonella and certain strains of E. coli are among the most serious pathogens found in animal manure. Pathogens can be a risk when fresh manure is applied to crops (1) that grow in or close to the soil and (2) that are eaten raw. This includes crops such as carrots, lettuce and other greens, and straw- berries. What if I Cannot Use All of the Manure on My Own Land? If you have more manure than you can use without risk- ing runoff or leaching, you will need to develop ways to sell the manure or give it away. Nutrient-rich manure such as poultry manure is in demand by farmers. It sells for $30 a yard in some parts of the country. Other manures are too bulky for farmers to buy, but gardeners often seek them to enrich their soil (Figure 5). Many gardeners are eager to buy or take manure from local farms. Farmers and gardeners may be willing to take or even buy manure from local farms. Appearance sells. A relatively dry, easy-handling product (Figure 6) will bring more repeat calls than material from a wet, smelly, or weedy pile. When you advertise manure to gardeners, let them know what it is good for. For example, advertise poultry manure as a fertilizer and horse manure as a mulch or soil amendment. Figure 6. Well-composted manure is dark and crumbly. Advertise poultry manure as a fertilizer, and horse manure as a mulch or soil amendment. Composting manure produces a more attractive product, reduces the volume of manure, and kills pathogens. Some composting methods do not need much equipment. tion. Visit local composters, too, to look at their systems and learn about which methods could work best for you. Fresh manure may con- tain Use well- aged or thoroughly composted manure on high-risk crops such as root crops and greens. 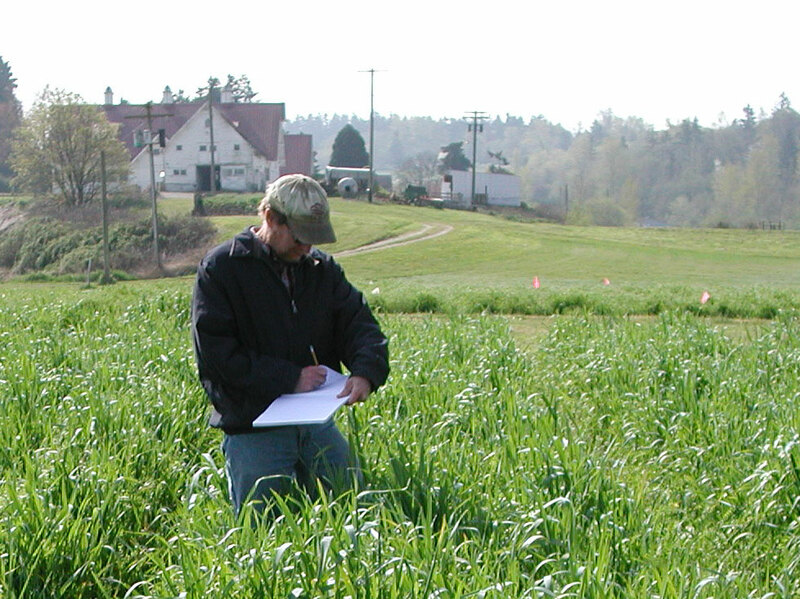 Craig Cogger, Soil Scientist, Washington State University, can be reached at 253-445- 4512 or cogger@wsu.edu. The author wishes to thank Diane Huntrods, the LPES Project Manager, at MWPS, Iowa State University, for editing this fact sheet and coordinating its completion. The author wishes to thank Marion Simon of Kentucky State University and Wayne Madson of Washington State University Extension, Colville, for their constructive reviews of this fact sheet. 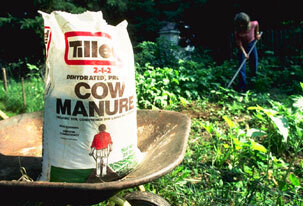 Fertilizing with Manure. PNW 533.WSU Extension Bulletin Office, Washington State University, Box 645912, Pullman, WA, 99164-5912, 1-800-723-1763 or http://cru.cahe.wsu.edu/CEPublications/pnw0533/pnw533.pdf. Managing Cover Crops Properly. Sustainable Agriculture Network. 1-802-656-0484 or www.sare.org/publications/covercrops/covercrops.pdf. On-Farm Composting Handbook. NRAES-54, Northeast Regional Agricultural Engineering Service, www.nraes.org or 1-800-562-3618 (MWPS). Environmental Stewardship for Horse Owners. LPES Small Farms Fact Sheet series. MWPS. Iowa State University, 1-800-562-3618 or www.mwpshq.org.